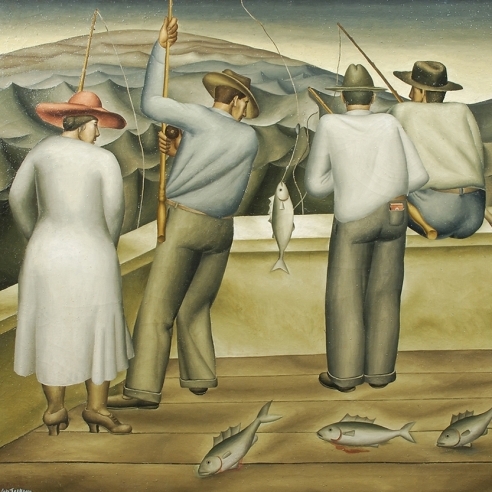 Oil on canvas, 19 3/4 x 27 3/4 in. Man and Woman with Acacia Tree is a San Diego picture. The Acacia tree is native to Mexico and the American Southwest, including Texas and southern California. It would have been a familiar friend to Jackson who was fond of setting off his human figures against a backdrop of local greenery. 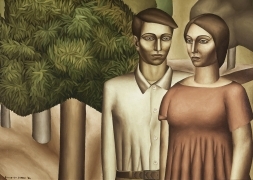 Scott Atkinson, former curator at the San Diego Art Museum and organizer of the 2008 traveling museum retrospective, notes that the work’s “pared down modern stylization” and posits that the figures in the work are generic versions of the artist and his wife. Anderson further notes that the picture "wonderfully illustrates Jackson’s ability to unify a composition through the repetition of a particular motif—in this case the vertical folds along the front of the woman’s dress, which are transformed into the folds of the man’s shirt where it tucks into his pants." 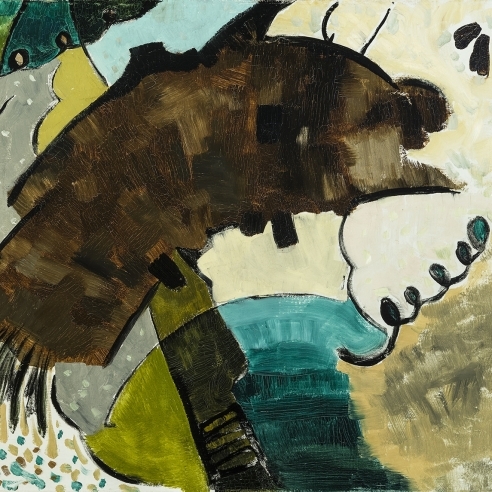 The point of the rigorous formal structure that Jackson customarily employed is that it engages the eye without the viewer being aware of the underlying geometries. 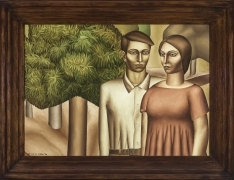 What we see in Man and Woman with Acacia Tree is a carefully executed composition whose subject, an attractive young couple set against a backdrop of nature, sparks a bond of human empathy expressed in the visual language of objective modernist art. This picture has remained in the Jackson family until the present.